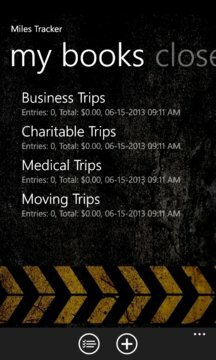 Miles Tracker application makes it easy to track your business and personal mileage. To add trips: select a book, click add and enter starting location and then click save. Once you arrive at the destination, enter destination information and click save. 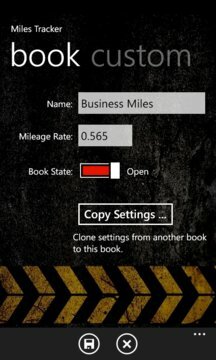 When you are ready to expense a book: Export the trip data, mark the book as closed and create a new book. + We recommend keeping your data backed up. OneDrive backup/restore is supported in the application settings. + If you prefer entering start and destination at the same time or you are importing data, leave Location Services off. + For multiple vehicles, edit book settings, select custom and turn on "show vehicles". + If you are getting a new phone: From your old phone select app menu (…) / application settings / one drive. Sign in to One Drive and click Backup. On your new phone use the restore option.